Mini LED is one of the important technologies for the year 2019, it will be be used for the displays of consumer electronics. On the other hand, Micro LED technology, which has been more eye-attracting in the recent years, is expected to be used on displays in the market by the year 2021. Featuring in high brightness and contrast, Mini LED is able to compete with OLED in the lines of cinema display and home theater display. The development of Mini LED would speed up in the next two years and Mini LED displays are anticipated to be on the market from the year 2019. It is estimated that the market value of Mini LED will be US$1699 million in the year 2022. Currently, many LED lights producers and panel makers have begun mass producing Mini LED products. Taiwanese LED manufacturers Lextar and Epistar have made shipment of their Mini LED products. Lextar has provided its Mini LED backlight products for gaming displays and Epistar will supply its RGB Mini LED package to Chinese and Korean clients for indoor and outdoor signage lighting. Chinese company NationStar has also reported its shipment of Mini LED products, it could expand its capacity according to the market demands. Besides, HC SemiTek has revealed its plan to produce Mini LED backlight products including smartphones, TVs, and automotive displays. 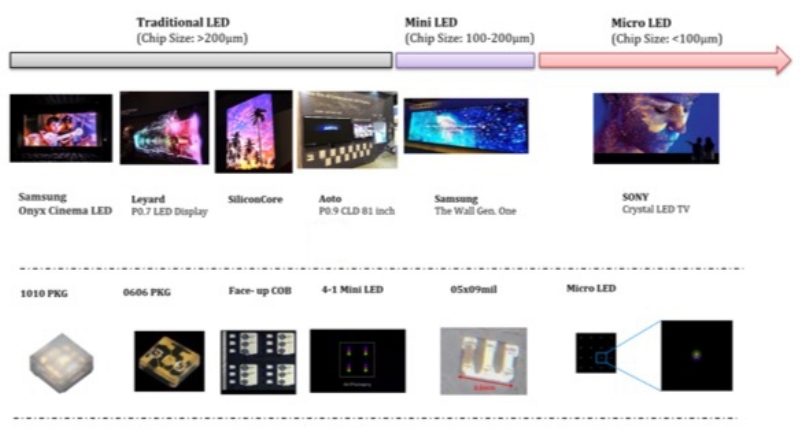 Micro LED, the next generation display technology which attracted attention from around the world, has continued to develop with the efforts dedicated by worldwide experts. The integration of the supply chain is very important for the development of Micro LED technology. The yield rate of the epitaxy wafer is so important for the chip process and will also affect cost for repairing afterwards. As cost is the most basic issue for the production of Micro LED, it is necessary to solve the difficulties from each process of Micro LED manufacturing. Many companies have begun vertical integration to push the development of Micro LED technology. The Foxconn group, for example, has cooperated with LED producers Epileds and AOT, mass transfer solution provider eLux, panel maker Innolux and Sharp to integrate its Micro LED development. The Korean giant, Samsung, has also been gossiped to be teaming with Taiwanese Micro LED startup PlayNitride and Chinese LED maker San’an for Micro LED technology. With the push from the industry of LED players, the application of Micro LED on middle size displays such as TVs and gaming monitors might begin to be in mass production by the year 2021.